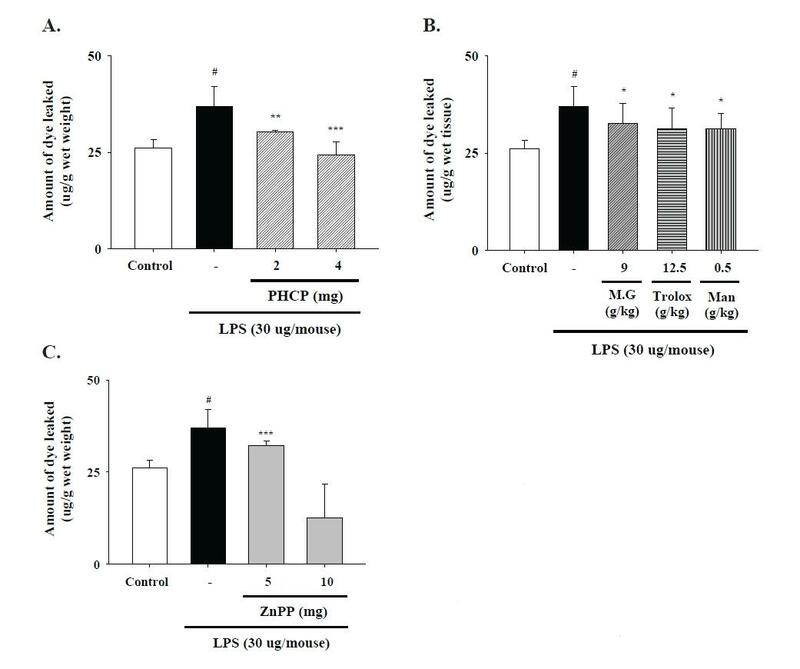 he anti-inflammatory effect of PHBV/Collagen (PHCP) was examined in a mouse model of lipopolysaccharide (LPS)-induced skin inflammation. Vascular permeability on the back skin was measured by the local accumulation of Evan’s blue dye after subcutaneous injection of LPS (30 µg site-1). Dye leakage in the skin showed a significant increase at 2 h after injection of LPS. This LPS-induced dye leakage was also completely inhibited by HO-1 inhibitor, ZnPP, and antioxidants, including methyl gallate, trolox, and mannitol. To study the possible mechanisms underlying the in vivo anti-inflammatory effect of PHCP against LPS-induced inflammation, we also examined the effects of PHCP on malondialdehyde (MDA) and glutathione levels in skin tissues and found that pretreatment with PHCP resulted in inhibited MDA elevation and a remarkable reduction of glutathione level. In addition, similar results were obtained after pretreatment with antioxidants, including trolox and mannitol, and HO-1 inhibitor, ZnPP. Histopathologically, an influx of neutrophils into the skin dermis was detected between 24 h and 72 h after LPS injection (30, 100 µg site-1), compared to control animals after injection of saline. This increase was greater in mice treated with 100 µg of LPS than in those treated with 30 µg of LPS and was significantly suppressed by pretreatment with PHCP, antioxidants, and HO-1 inhibitor. 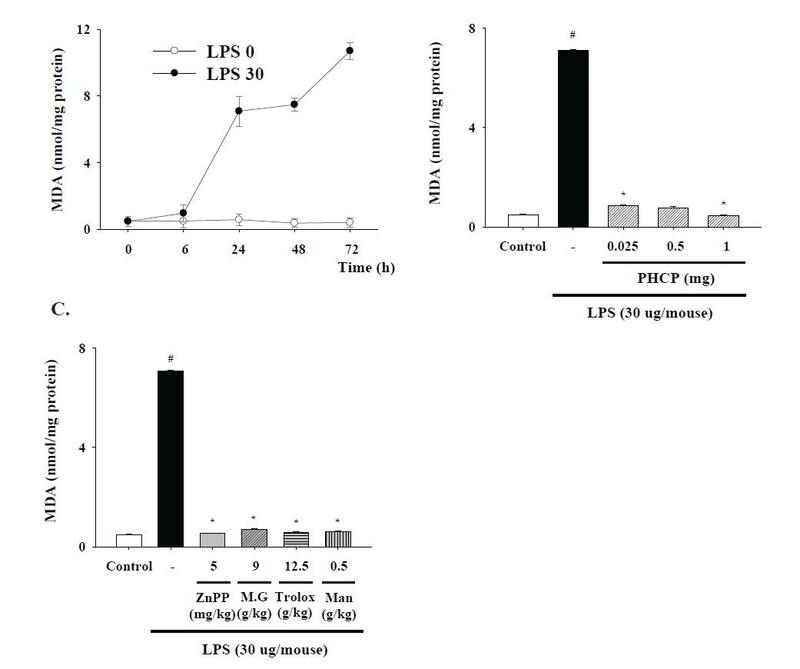 These results collectively suggest that PHCP has an anti-inflammatory effect against LPS-induced inflammation model in vivo and may be a good candidate for the skin tissue engineering biomedical application primarily through manipulation of the redox state. 나노기술(Nanotechnology)은 최근 광범위하게 개발되고 있는 의료분야로, 조직 형성을 유도하는 적절한 생물질을 이용하여 생체조직을 동일하게 만들고자 하는 새로운 조직 공학적 접근이 이용되어왔다[1, 2]. 조직 공학의 기질로는 polylactic acid (PLA), poly (lactic-co-glycolic acid, PLGA)와 같은 다양한 합성물을 비롯하여 섬유소, 키토산, 콜라겐과 같은 천연 중합체들이 이용된다[3, 4]. 콜라겐은 나노미터 수준(50~100 nm)의 마이크로 피브릴로 세포외 결체조직을 이루는 펩타이드이다. 창상의 치유과정은 염증단계, 상피화단계, 증식단계, 성숙단계의 4단계로 구분될 수 있으나 각 단계는 명확한 구분없이 어느 정도 중첩되면서 연속적으로 진행된다. 본 연구실에서는 지금까지의 치료는 ‘상처를 덮는다’라는 의미에서 ‘치유한다’라는 보다 적극적인 의미의 공격형 치료 재료를 구성하고자 콜라겐을 함유하는 hydroxybutyrate-co-hydroxyvalerate (PHBV)/Collagen (PHCP) 나노섬유를 제조하였다. 염증은 다양한 질환에서 공통적으로 야기되는 병리현상으로, 발생은 외부자극에 대한 염증세포의 과반응으로 나타나며, 일차적으로 세포막상에서의 다양한 변화가 관찰된다. Lipopolysaccharide (LPS)는 그람음성균의 세포 표면을 구성하는 대표적인 물질로서, 체내에서 LPS는 binding protein (LBP) 또는 carrier protein와 결합을 하여 toll-like receptor (TLR)4을 활성화시키고, TNF-α, IFN-β 와 같은 염증 유발 싸이토카인 발현을 유도한다. 더욱이, 박테리아 감염이 심각할 경우, 면역세포의 과민반응으로 독성이 심한 염증인자들이 과 분비되고, 여러 장기에 치명적인 손상을 가져와 환자를 사망에 이르게 하는 패혈증 증후군에 결정적인 역할을 한다. 이러한 LPS로 인해 정상세포벽은 끊임없이 공격을 받고 있으며, 세포벽의 파괴로 다양한 염증 매개물질이 생성되고, 활성산소(Reactive oxygen species, ROS)와 같은 프리 라디칼이 형성되어 조직의 손상을 일으킨다. 프리 라디칼은 외짝 전자를 가지고 있는 원자 혹은 분자를 일컫는 말로 매우 불안정하고 높은 화학적 반응성이 있어 생체세포를 공격하여 지질과 단백질 핵산(DNA, RNA)을 파괴하고, 여러 가지 효소기능들을 저해하여 질병을 촉진시킨다[8, 9]. Heme oxygenase (HO)는 heme의 분해 대사과정에 관여하는 속도 조절효소로 heme을 분해하여 biliverdin, free iron, 및 일산화탄소 등을 생성시킨다. Biliverdin은 즉각적으로 환원 효소에 의해 빌리루빈이 되는데 강력한 항산화 작용으로 허혈성 심장질환과 산화적 손상 모델에서 세포보호작용을 한다고 밝혀져 있다. HO는 HO-1, HO-2, HO-3라는 3개의 이형체를 가지고 있고 이들은 서로 다른 유전자에서 발현되고, 이들의 발현은 세포의 형태, 조직의 분포와 그 조절에 의해 각각 다르게 일어난다[10, 12]. HO-1은 Heat Shock Protein (HSP)계의 한 종류로 32k Da의 분자량을 갖는 유도성이형체로서 생리적 상황에서 모든 조직에서 발현되나 특히 간이나 비장에서 높게 발현된다. HO-1의 발현은 저산소 상태, UV 방사선, 카드뮴, 납, 수은과 같은 중금속이나[15, 16] 활성산소종[17, 18] 등의 다양한 스트레스성 자극에 반응하여 생체방어 기능을 갖는 것으로 알려져 있는데 세포성장이나 세포사를 조절하는 것으로 보고되고 있다[19, 20]. 본 연구에서는 동물염증모델 실험으로 세포벽에 존재하는 구성물질의 일종인 그람 음성 균인 LPS로 유도한 염증모델로 마우스의 혈관투과성변화, 항산화물질인 GSH 함량 변화, 과산화정도 지표인 malondialdehyde (MDA) level 변화, 염증세포의 조직병리학적인 변화를 검증함으로써 PHBV와 Collagen이 복합된 PHCP 나노섬유의 항염증 효능과 그 역할을 규명하고자 하였다. 시료의 추출 및 분획에 사용된 유기용매 에탄올은 Duksan사 (Ansan, Kyungkido, Korea)로부터 구입하였으며, lipopolysaccharide (LPS, Escherichia coli), Evan’s blue dye (EBD), poly (hydroxybutyrate-co-hydroxyvalerate) (PHBV), ZnPP, d-mannitol은 Sigma-Aldrich (St. Louis, MO, USA)로부터 구입하였으며, collagen은 Gellatin Ltd (Incheon, Korea)에서 구입하여 사용하였다. BIOXYTEK GSH-400 assay kit은 Oxis Research (Portland, OR, USA)사로부터, OXYTEK TBARS assay kit은 Alexis (Farmindale, NY, USA)사로부터 구입하였으며, methylgallate는 Fluka (St. Louis, MO, USA), anti heme oxygenase-1 (HO-1) antibody (OSA-150)는 Stressgen Inc (Farmingdale, NY, USA)사로부터 구입하였으며, 이외 모든 시약도 Sigma-Aldrich (St. Louis, MO, USA)사로부터 구입하여 사용하였다. 실험에 사용한 기기로는 ELISA reader (Molecular Device, Sunny vale, USA), High centrifuge (Micro 17TR, Hanil, Korea), Multitube centrifuge (VS-550, Vision, Korea), Homogenizer (Sonifier 450, Branson Co (USA)., 등이었다. LPS는 증류수에 용해하여 사용하였다. 본 연구에 사용된 생분해성 고분자인 PHBV는 나노섬유의 직경과 가장 유사한 직경의 나노섬유를 제공할 수 있는 용매로 TFE를 사용하였다. 용액의 제조방법은 PHBV를 용매인 TFE에 완전히 용해시킨 후 상온에서 6시간 이상 교반하여 충분히 혼합되었을 때 사용하였다. Viscometer (LVDV II+ , Brookfield)를 이용하여 25℃에서 PHBV/collagen의 비가 30/70이 되도록 제조된 용액의 점도를 사용하였다. 수컷 ICR 마우스(25 ± 5 g)를 효창 사이언스(대구, 한국)사로부터 구입하여 1주일간 환경에 순화시킨 후 체중이 30 g 전후 되었을 때 실험에 사용하였다. 대조군 및 시험군을 각 5-6마리씩으로, 군별로 케이지에 분리시키고 실내온도 23 ± 1℃, 12시간 명암주기에서 고형사료와 물을 자유롭게 섭취하도록 하였다. 모든 동물실험은 국립보건연구원의 동물실험 지침에 따라 경북대학교 의학전문대학원 병리학교실에서 수행되었으며 경북대학교 동물실험윤리위원회에서 실험방법을 승인하였다. 국소염증은 LPS(30 μg site-1)를 마우스 등에 피하로 주사하여 유도 하였다. 2시간 후 마우스를 희생시켜서 염증부위 조직을 떼낸 뒤 분석 전까지 -70℃에 보관하여 실험에 사용하였다. 정상군(NOR; normal group)은 0.9% 생리식염수액을, 양성대조군(CON; LPS-treated group)은 LPS (30 μg/mouse)를, 또한 시험군(PHCP and LPS 투여군은 PHCP 2, 4 mg 용액을 진피층에 피하로 주사한 후 LPS (s.c.)를 주사하였다. 억제제 처리는 LPS 투여 5-60분 전에 각각의 주사경로 및 최대용량을 투여하였다. 실험에 사용할 샘플은 각 군별로 처리한 마우스를 경추골절로 희생시킨 후 마우스 등의 국소염증부위조직을 떼낸 뒤 0.9% 생리식염수로 세척, 여지로 흡착한 후 -70℃에 보관하여 분석에 사용하였다. 혈관투과성 정도는 EBD (1%)의 삼출 정도로 비교하였다. EBD (100 mg/kg)는 LPS 피하주사 5분 전 꼬리정맥으로 주사하였다. LPS 주사 2시간 후 마우스를 경추골절로 희생시킨 후 LPS를 주사한 부위(약 1 g)를 떼낸 뒤 조직을 Na2SO4와 acetone용액으로 추출하였다. 조직내로 유출된 EBD 추출액의 정도는 590 nm 파장으로 흡광도를 측정하여 그 양(μg/mg wet tissue)을 정량하였다. 각 군의 피부 조직을 metaphosphoric acid (MPA) 용액으로 균질화한 후 300 G, 4℃에서 10분간 원심분리하여 얻은 상층액으로 GSH-400 assay kit의 사용자 매뉴얼에 따라 분광광도계(Molecular Device, Sunnyvale, USA)로 400 nm의 파장으로 흡광도를 측정하여 표준 검량선에 의하여 계산하였다. 지질과산화반응의 최종산물인 malondialdehyde (MDA) 농도는 TBARS assay kit을 이용하였으며 각군의 피부조직을 균질화한 후 300 G, 4℃에서 10분간 원심 분리하여 얻은 상층 액으로 분광광도계로 535 nm의 파장에서 흡광도를 측정하여 표준검량선에 의하여 계산하였다. 각각의 약물과 LPS 처리 후 적출한 피부조직을 1 × 1 cm 크기로 진피층까지 자른 후 10% 포르말린 용액에서 고정한 후 조직 처리 과정을 거쳐 파라핀으로 포매한 후 4 μm의 두께로 자른 후 Hematoxylin & eosin으로 염색 후 광학현미경으로 관찰하였다. 본 실험에 대한 모든 실험 결과는 평균치와 표준편차로 나타내었고, 각 군간의 차이는 ANOVA후 Dunnett’s test를 사용하여 검정하였고 P값이 0.05미만인 경우 통계적으로 유의한 차이가 있는 것으로 판정하였다. EBD 유출정도는 대조군에 비하여 LPS (30 μg/mouse) 시간 경과에 따라 점차 증가하다가 2시간을 경과하면서 현저하게 증가하였다. 여기서는 LPS투여 후 증가시점인 2시간을 측정시간으로 정하였다(Fig. 1A). LPS 농도증가에 따른 EBD 유출정도는 농도 의존적으로 증가하였다(Fig. 1B). 또한 PHCP처리군에서는 LPS처리군에 비하여 용량 의존적으로 억제되었고 4 mg 처리군에서는 거의 정상 레벨 정도의 억제효과를 보이는 점으로 항염증 효과를 확인할 수 있었다(Fig. 2A). Fig. 2B, C의 결과에서는 전처리한 라디칼소거제군, HO-1 활성 억제제인 ZnPP군에서도 대조군에 비해 약간, 혹은 50% 이상 억제하여 콜라겐 함유 나노섬유 구성성분의 항염증효과를 확인하였다. 모든 실험 결과는 평균치와 표준편차로 나타내었으며, #P 값은 대조군과 0.05 미만, *P, **P , ***P 값은 LPS 처리군과 0.05, 0.01, 0.001 미만의 통계적 유의한 차이가 있는 것으로 판정하였다. Fig. 1. Time and dose-dependent changes on LPS-induced vascular permeability in mouse skin. (A) Mice were treated with intradermal injection of LPS (0-30 μg site-1) or saline at the dorsal skin 2 h prior to EBD (100 mg/kg, i.v.). Control mice received saline instead of LPS. Five minutes after EBD, LPS was injected at the dorsal skin in mice. Two hours later of the LPS injection, dye in the skin was extracted and determined colorimetrically. Vascular permeability was measured colorimetrically 0, 6, 24, 48, 72 h after intradermal LPS or saline injection. (B) Mice were treated with intradermal injection of LPS (0-100 μg site-1) or saline at the dorsal skin 2 h prior to EBD (100 mg/kg, i.v.). Control mice received saline instead of LPS. Five minutes after EBD, LPS was injected at the dorsal skin. Two hours later of the LPS injection, dye in the skin was extracted and determined colorimetrically. All data are presented as means ± SE. #P<0.05 vs. Control group. Fig. 2. Effect of PHCP and inhibitors on LPS-induced vascular permeability in mouse skin. (A) Mice were pretreated with PHCP (2-4 mg site-1, s.c.) at the dorsal skin 1 h prior to EBD (100 mg/kg, i.v.). Five minutes after EBD, LPS (30 μg site-1, s.c.) was injected at the dorsal skin in mic. Two hours later of the LPS injection, dye in the skin was extracted and determined colorimetrically. (B) Mice were pretreated with inhibitors 5 min-1 h prior to EBD (100 mg/kg, i.v.). Five minutes after EBD, LPS (30 μg site-1, s.c.) was injected at the dorsal. Two hours later of the LPS injection, dye in the skin was extracted and determined colorimetrically. Methyl gallate (M.G. ): 9 g/kg, trolox: 12.5 g/kg, mannitol (Man): 0.5 g/kg. (C) Mice were treated with intradermal injection of LPS (30 μg site-1) or saline at the dorsal skin 2 h prior to EBD (100 mg/kg, i.v.). Control mice received saline instead of LPS. Mice were pretreated with inhibitors 40 min prior to LPS injection. ZnPP: 5-10 mg/kg was injected at the dorsal. Two hours later of the LPS injection, dye in the skin was extracted and determined colorimetrically. All data are presented as means ± SE. #P<0.05 vs. Control group. **P< 0.01, ***P< 0.001 vs. LPS 30 (μg) group. 지질과산화의 지표인 MDA의 생성에 미치는 영향을 Fig. 3에 나타냈다. LPS처리한 대조군의 경우 정상군에 비해 시간이 경과함에 따라 약 7배 정도로 높게 나타남으로서, LPS로 인한 지질과산화를 확인하였다(Fig. 3A). PHCP투여군은 대부분이 억제효과를 보임으로써 지질과산화 억제효과를 가지는 것으로 나타났다(Fig. 3B). Fig. 3C에서 보는 바와같이 라디칼소거제군, HO-1 활성 억제제인 ZnPP 투여군에서도 거의 정상수준 정도로 지질과산화를 억제시킴으로서 총 지질 함량 개선이 나타났다. 모든 실험 결과는 평균치와 표준편차로 나타내었으며, #값은 대조군과 0.05 미만, *P 값은 LPS 처리군과 0.05 미만의 통계적 유의한 차이가 있는 것으로 판정하였다. Fig. 3. Effects of PHCP and inhibitors on LPS-induced MDA level in mouse skin. (A) Mice were treated with intradermal injection of LPS (0-30 μg site-1) or saline. Control mice received saline instead of LPS injection. MDA levels were measured colorimetrically 0, 6, 24, 48, 72 h after intradermal LPS or saline injection. Each time point represents the mean change in MDA level compared to the baseline control level (n=4-9). (B) Mice were pretreated with PHCP (0.025-1 mg site-1, s.c.) at the dorsal skin 1 h prior to LPS (30 μg site-1, s.c.) injection. Changes in MDA level of skin were determined 24 h after the intraderrmal injection. (C) Mice were pretreated with inhibitors 5 min-1 h prior to LPS (30 μg site-1, s.c.) injection. ZnPP (5 mg/kg, i.d. ), methyl gallate (M.G., 9 g/kg, i.p. ), trolox (12.5 g/kg, i.p. ), mannitol (Man, 0.5 g/kg, i.v.). All data are presented as means ± SE. #P<0.05 vs. Control group. *P<0.05, vs. LPS 30 (μg) group. PHCP 투여에 따른 GSH함량을 측정한 결과는 Fig. 4와 같다. Fig. 4에서 보여주는 바와 같이 LPS의 투여로 감소한 GSH는 PHCP처리군에서는 용량 의존적으로 증가하였고, PHCP 3 mg 투여 군에서는 정상 수준 정도로 측정되었다. 라디칼소거제군, HO-1 활성 억제제인 ZnPP 투여군에서도 약간 증가 되는 것이 관찰되었다. 모든 실험 결과는 평균치와 표준편차로 나타내었으며, #P 값은 대조군과 0.05 미만, *P, **P 값은 LPS 처리군과 0.05, 0.01 미만의 통계적 유의한 차이가 있는 것으로 판정하였다. Fig. 4. 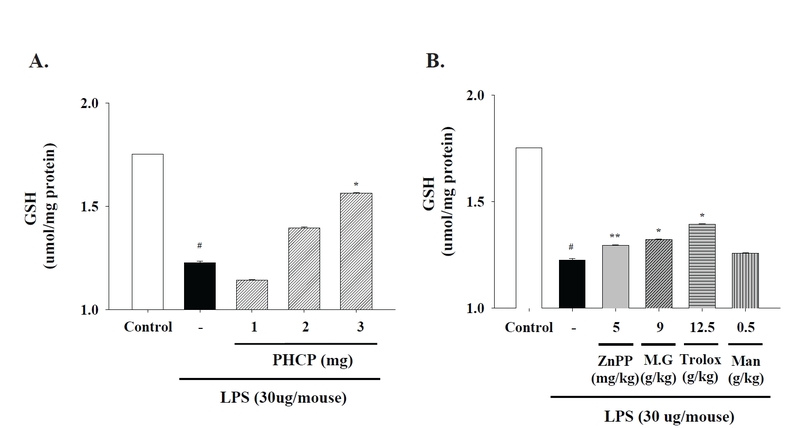 Effects of PHCP and inhibitors on LPS-induced GSH level in mouse skin. (A) Mice were pretreated with PHCP (1-3 mg site-1, s.c.) at the dorsal skin in mice 1 h prior to LPS (30 μg site-1, s.c.) injection. (B) Mice were pretreated with inhibitors 5 min-1 h prior to LPS (30 μg site-1, s.c.) injection. ZnPP (5 mg/kg, i.d. ), methyl gallate (M.G., 9 g/kg, i.p. ), trolox (12.5 g/kg, i.p. ), mannitol (Man, 0.5 g/kg, i.v.). Changes in GSH level of skin tissues were determined colorimetrically 24 h after the intraderrmal injection of LPS. All data are presented as means ± SE. #P<0.05 vs. Control group. *P<0.05, vs. LPS 30 (μg) group. 조직학적 변화는 Fig. 5에 보여주는 바와 같이 saline 투여 1, 3일 후에는 아무런 염증변화가 관찰되지 않았다(Fig. 5A-1, 2). 그러나, LPS 30 μg (Fig. 5A-3, 4), 100 μg (Fig. 5A-5, 6)을 투여한 경우, 용량의존적, 시간경과에 따라 염증세포의 침윤이 증가하였다 (Fig. 5A). 여기에 출현한 세포는 거의 호중구로 생각된다. 이후, LPS투여로 보여지는 조직변화에 미치는 PHCP, 라디칼소거제, HO-1 활성 억제제인 ZnPP의 영향을 조사하였다. LPS (30 μg site-1 , s.c.) 투여 1일 후의 변화를 관찰하였다. 대조군(Fig. 5B-1, 2)에 비해 PHCP 투여군(1mg/mouse, Fig. 5B-3, 4), HO-1 활성 억제제인 ZnPP투여군(Fig. 5B-5, 6), 라디칼소거제군(Fig. 5B-7, 8, 9, 10)에서는 염증세포 침윤이 현저하게 줄어드는 것으로 보아 PHCP의 항염증 효과를 확인할 수 있었다. Fig. 5. Effect of PHCP on the leucocyte filtration in mouse skin. 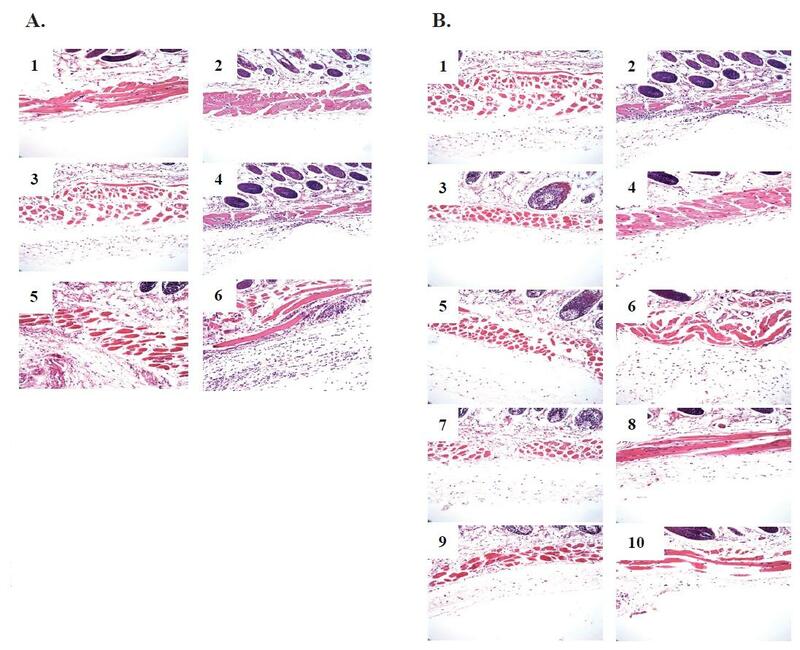 (A) Numerous neutrophils in the skin dermis 24 (1, 3, 5), 72 h (2, 4, 6) after injection of LPS (30-100 μg site-1, s.c.), Control (1, 2) mice received saline instead of LPS (B) Light micrograph of neutrophil changes 24 (1, 3, 5, 7, 9), 72 h (2, 4, 6, 8, 10) after LPS (30 μg site-1, s.c.) injection in the skin dermis in mice. Antioxidants and HO-1 inhibitor study: Mice were pretreated with inhibitors 5 min-1 h prior to LPS (30 μg site-1, s.c.) injection. PHCP (1 mg/kg, i.d., 3, 4), ZnPP (5 mg/kg, i.d., 5, 6), methyl gallate (M.G., 9 g/kg, i.p. 7, 8), trolox (12.5 g/kg, i.p., 9, 10). 본 연구는 경북대학교 의학전문대학원 병리학교실에서 전기방사법에의해 제조된 콜라겐 함유 PHCP 나노섬유 성분의 항염, 항산화효과 결과로, 국소부종정도, 지질과산화 및 GSH 레벨 변화와 HO-1 활성 억제제인 ZnPP, radical scavengers 투여로 다형핵 백혈구의 침윤변화를 관찰하였다. 나노섬유는 뛰어난 생체적합성과 생분해성으로 인공피부의 지지체로 최근 주목 받고 있다[2, 3, 21, 22]. Noh 등은 창상 피복과 조직공학을 위한 지지체로 키틴 나노섬유 매트릭스를 전기방사법으로 제조한 후 콜라겐으로 코팅 하였으며, Park 등은 피부 재생을 위해 키틴/silk fibroin 혼합 나노섬유 지지체를 제조하였다. 또한 Kang 등은 생분해성 폴리에스테르에 콜라겐을 30% 넣어 복합 방사한 PHCP 나노섬유 쉬이트를 연구하였다. 피부는 인체의 큰 기관으로, 전체 체중의 8%를 차지하고 평균두께는 1.5-4 mm 정도로 표피층, 진피층, 피하조직 등 크게 3층으로 나뉘어져 있으며, 창상은 염증, 상피화, 증식, 성숙의 네 단계로 구분될 수 있으나, 각 단계는 명확한 구분 없이 어느 정도 중첩되면서 연속적으로 진행된다. 먼저, 초기단계인 염증은 그람 음성균인 LPS를 마우스 등에 피하 주사하여 국소염증모델을 만들었다. 하루 뒤 국소부종정도 변화, GSH 함량 변화, 지질과산화변화, histology 등을 injury target으로 하여 비교 분석하였다. LPS에 의한 부종 정도는 EBD로 정량하여, 모세혈관 투과성 정도를 확인하였다(Fig. 1, 2) [26, 27]. 혈관투과성을 측정하는 방법으로는 분자 무게가 60 kD인 EBD를 이용하였다[26, 27]. EBD는 혈장 알부민과 결합하여 혈관의 투과성이 증가되면 혈관으로부터 조직내로 알부민과 함께 유출된다. 혈관내 존재하는 dye를 제거하고 조직 내 존재하는 dye를 추출하여 분광광도계로 정량하여 혈장의 혈관외유출 정도를 측정할 수 있었다. PHCP 투여에 따른 지질과산화의 지표인 MDA의 생성에 미치는 영향과 GSH 함량 변화는 Fig. 3, 4에 각각 정리하였다. LPS처리한 대조군의 경우 정상군에 비해 시간이 경과함에 따라 LPS로 인한 지질과산화를 확인하였으며, PHCP투여군에서는 대부분이 억제효과를 나타냈다. 그리고, 라디칼소거제군, HO-1 활성 억제제인 ZnPP 투여군에서도 거의 정상수준 정도로 지질과산화, GSH 함량 변화가 억제되었다. 프리라디칼은 여러 가지 독성물질과 약물에 의한 병태 생리학적 현상이나 조직의 손상 정도를 나타내는 가장 중요한 기전으로, 이러한 결과들은 PHCP가 염증기전인 프리라디칼을 제거하는 중요한 역할을 한다는 것을 의미한다. 또한 유도성 효소인 HO-1은 Reactive Oxygen Species (ROS)를 증가시키는 조건인 LPS, 저산소증, 과산소증, 산화질소, heat shock, UV 방사선 등에 의해 발현되어 산화 스트레스, 염증반응, 세포사, 이식거부에 대한 보호기능을 하는 것으로 알려져 있다. HO-1 억제제인 ZnPP 효과는 ROS에 의한 염증반응에 대하여 HO-1의 보호효과 때문인 것으로, Heme은 다양한 활성산소종의 생성을 유도하고, 증가된 세포 내 산화제는 다양한 종류의 세포에서 세포사를 초래하는데[29, 30], HO-1은 이러한 heme을 분해시켜 ferritin의 합성을 증가시킴으로써 전산화제의 양을 감소시킨다. 또한 heme의 대사과정에서 HO과 biliverdin reductase에 의해 생성된 빌리루빈은 강력한 활성산소종의 제거기능으로 항염효과가 나타난 것으로 추측되었다. Fig. 5에 나타내는 바와 같이 LPS투여로 증가된 다형핵백혈구의 침윤은 PHCP투여로 억제되었다. 이는 허혈-재관류모델, 피부염증에 SOD투여로, 또는 초산유도결장염에서 저분자 SOD와 같은 활성물질 투여로 염증주위의 내피세포에 호중구의 침착이 활성산소 소거제에 저해되는 현상과 동일하게 해석되어진다. 호중구 침투는 내피세포 표면 혹은 호중구 표면에 접착 분자의 발현을 포함한 여러 복잡한 과정으로 생성된다고 알려져있다[34, 35] 많은 chemokine이나 TNF-α를 비롯한 사이토카인은 CD11/CD18과 같은 integrin이나 L-selectin, I-CAM-1 등의 접착 분자의 발현을 촉진한다. 최근 낮은 농도의 H₂O₂가 배양 내피세포에 P-selectin 과 ICAM-1 의 발현을 유도하는 것으로 보고되었다. 또한 석면은 폐상피세포에서 interleukin-8 (IL-8) 유전자 전사가 시작되었으나, 전사인자 NF-κB의 IL-8 유전자 전사 발현영역에서 라디칼소거제인 tetrathiourea에 의해 부분적으로 저해되었으며, IL-8은 호중구 chemokine factor로 알려져있다. 위의 결과는 ·OH를 포함한 활성산소종이 염증부위의 호중구 침윤을 지배하는 한 요인임을 시사하는 것이다. 이로써, PHCP, HO-1 활성 억제제인 ZnPP투여, 라디칼소거제 전처치후 LPS로 인한 다형핵 백혈구의 침윤이 억제되는 것은 세포 접착 분자와 사이토카인의 유도에 참여 활성산소종을 PHCP 및 이러한 화합물들이 소거했을 가능성으로 생각할 수 있다. 또한, 호중구에서 유리하는 활성산소종에 의해 질환이 더욱 증폭되는 것으로 추측되고 있지만, 이 점에 대해서는 향후의 검토의 여지를 남겨두고 있다. 위의 결과를 종합하여볼 때, 전기방사법에 의해 제조된 콜라겐 함유 PHCP 나노섬유 주성분은 LPS로 유도한 피부염증에 항염, 항산화효과를 보임으로써 창상피복재로서 높은 가능성을 재확인하였다. 따라서 PHCP 나노섬유 주성분은 피부염증에 항염, 항산화효과를 가진 물질로써, 창상피복재로서 활용할 수 있을 것이라고 기대된다. 이 논문은 2007년 지식경제부지원 지역산업기술개발과 2010년도 정부(교육과학기술부)의 재원으로 한국연구재단의 대학중점연구소 지원사업으로(2011-0031403) 수행되었으므로 이에 감사드립니다. 1.Langer R, Vacanti JP. Tissue engineering. Science 1993;260(5110):920-926. 2.Zhang YZ, Su B, Venugopal J, Ramakrishna S, Lim CT. Biomimetic and bioactive nanofibrous scaffolds from electrospun composite nanofibers. Int J Nanomedicine 2007;2(4):623-638. 3.Han I, Shim KJ, Kim JY, Im SU, Sung YK, Kim M, Kang IK, Kim JC. Effect of poly(3-hydroxybutyrate-co-3-hydroxyvalerate) nanofiber matrices cocultured with hair follicular epithelial and dermal cells for biological wound dressing. Artif Organs 2007;31(11):801-808. 4.Kim EJ, Yoon SJ, Yeo GD, Pai CM, Kang IK. Preparation of biodegradable PLA/PLGA membranes with PGA mesh and their application for periodontal guided tissue regeneration. Biomed Mater 2009;4(5):055001. 5.Yun CH, Jeon YJ, Yang Y, Ju HR, Han SH. Chlorophyllin suppresses interleukin-1 beta expression in lipopolysaccharide-activated RAW 264.7 cells. Int Immunopharmacol 2006;6(2):252-259. 6.Han SH, Kim JH, Seo HS, Martin MH, Chung GH, Michalek SM, Nahm MH. Lipoteichoic acid-induced nitric oxide production depends on the activation of platelet-activating factor receptor and Jak2. J Immunol 2006;176(1):573-579. 7.Arimoto T, Kadiiska MB, Sato K, Corbett J,Mason RP. Synergistic production of lung free radicals by diesel exhaust particles and endotoxin. Am J Respir Crit Care Med 2005;171(4):379-387. 8.Halliwell B. Free radicals, reactive oxygen species and human disease: a critical evaluation with special reference to atherosclerosis. Br J Exp Pathol 1989;70(6):737-757. 9.Halliwell B. Antioxidant defence mechanisms: from the beginning to the end (of the beginning). Free Radic Res 1999;31(4):261-272. 10.Tenhunen R, Marver HS, Schmid R. The enzymatic catabolism of hemoglobin: stimulation of microsomal heme oxygenase by hemin. J Lab Clin Med 1970;75(3):410-421. 11.Baranano DE, Rao M, Ferris CD, Snyder SH. Biliverdin reductase: a major physiologic cytoprotectant. Proc Natl Acad Sci USA 2002;99(25):16093-16098. 12.McCoubrey WK Jr, Huang TJ, Maines MD. Isolation and characterization of a cDNA from the rat brain that encodes hemoprotein heme oxygenase-3. Eur J Biochem 1997;247(2):725-732. 13.Motterlini R, Foresti R, Bassi R, Calabrese V, Clark JE, Green CJ. Endothelial heme oxygenase-1 induction by hypoxia. Modulation by inducible nitric-oxide synthase and S-nitrosothiols. J Biol Chem 2000;275(18):13613-13620. 14.Doi K, Akaike T, Fujii S, Tanaka S, Ikebe N, Beppu T, Shibahara S, Ogawa M, Maeda H. Induction of haem oxygenase-1 nitric oxide and ischaemia in experimental solid tumours and implications for tumour growth. Br J Cancer 1999;80(12):1945-1954. 15.Eyssen-Hernandez R, Ladoux A, Frelin C. Differential regulation of cardiac heme oxygenase-1 and vascular endothelial growth factor mRNA expressions by hemin, heavy metals, heat shock and anoxia. FEBS Lett 1996;382(3):229-233. 16.Elbirt KK, Whitmarsh AJ, Davis RJ, Bonkovsky HL. Mechanism of sodium arsenite-mediated induction of heme oxygenase-1 in hepatoma cells. Role of mitogen-activated protein kinases. J Biol Chem 1998;273(15):8922-8931. 17.Lautier D, Luscher P, Tyrrell RM. Endogenous glutathione levels modulate both constitutive and UVA radiation/hydrogen peroxide inducible expression of the human heme oxygenase gene. Carcinogenesis 1992;13(2):227-232. 18.Keyse SM, Tyrrell RM. Heme oxygenase is the major 32-kDa stress protein induced in human skin fibroblasts by UVA radiation, hydrogen peroxide, and sodium arsenite. Proc Natl Acad Sci USA 1989;86(1):99-103. 19.Amon M, Menger MD, Vollmar B. Heme oxygenase and nitric oxide synthase mediate cooling-associated protection against TNF-alpha-induced microcirculatory dysfunction and apoptotic cell death. FASEB J 2003;17(2):175-185. 20.Wagner M, Cadetg P, Ruf R, Mazzucchelli L, Ferrari P, Redaelli CA. Heme oxygenase-1 attenuates ischemia/reperfusion-induced apoptosis and improves survival in rat renal allografts. Kidney Int 2003;63(4):1564-1573. 21.Wickett RR. Basics of skin structure. J Cosmet Sci 2004;55(1):132-133. 22.Martins A, Araujo JV, Reis RL, Neves NM. Electrospun nanostructured scaffolds for tissue engineering applications. Nanomedicine (Lond) 2007;2(6):929-942. 23.Noh HK, Lee SW, Kim JM, Oh JE, Kim KH, Chung CP, Choi SC, Park WH, Min BM. Electrospinning of chitin nanofibers: degradation behavior and cellular response to normal human keratinocytes and fibroblasts. Biomaterials 2006;27(21):3934-3944. 24.Park KE, Jung SY, Lee SJ, Min BM, Park WH. Biomimetic nanofibrous scaffolds: preparation and characterization of chitin/silk fibroin blend nanofibers. Int J Biol Macromol 2006;38(3-5):165-173. 25.Meng W, Kim SY, Yuan J, Kim JC, Kwon OH, Kawazoe N, Chen G, Ito Y, Kang IK. ElectrospunPHBV/collagen composite nanofibrous scaffolds for tissue engineering. J Biomater Sci Polym Ed 2007;18(1):81-94. 26.Irie K, Fujii E, Ishida H, Wada K, Suganuma T, Nishikori T, Yoshioka T, Muraki T. Inhibitory effects of cyclic AMP elevating agents on lipopolysaccharide (LPS)-induced microvascular permeability change in mouse skin. Br J Pharmacol 2001;133(2):237-242. 27.Nishikori T, Irie K, Suganuma T, Ozaki M, Yoshioka T. Anti-inflammatory potency of FR167653, a p38 mitogen-activated protein kinase inhibitor, in mouse models of acute inflammation. Eur J Pharmacol 2002;451(3):327-333. 28.Rushworth SA, Chen XL, Mackman N, Ogborne RM, O'Connell MA. Lipopolysaccharide-induced heme oxygenase-1 expression in human monocytic cells is mediated via Nrf2 and protein kinase C. J Immunol 2005;175(7):4408-4415. 29.Dumont A, Hehner SP, Hofmann TG, Ueffing M, Droge W, Schmitz ML. Hydrogen peroxide-induced apoptosis is CD95-independent, requires the release of mitochondria-derived reactive oxygen species and the activation of NF-kappaB. Oncogene 1999;18(3):747-757. 30.Slater AF, Stefan C, Nobel I, van den Dobbelsteen DJ, Orrenius S. Signalling mechanisms and oxidative stress in apoptosis. Toxicol Lett 1995;82-83:149-153. 31.Vile GF, Tyrrell RM. Oxidative stress resulting from ultraviolet A irradiation of human skin fibroblasts leads to a heme oxygenase-dependent increase in ferritin. J Biol Chem 1993;268(20):14678-14681. 32.Komatsu H, Koo A, Ghadishah E, Zeng H, Kuhlenkamp JF, Inoue M, Guth PH, Kaplowitz N. Neutrophil accumulation in ischemic reperfused rat liver: evidence for a role for superoxide free radicals. Am J Physiol 1992;262(4 Pt 1):G669-G676. 33.Warren JS, Yabroff KR, Mandel DM, Johnson KJ, Ward PA. Role of O2- in neutrophil recruitment into sites of dermal and pulmonary vasculitis. Free Radic Biol Med 1990;8(2):163-172. 34.Weiss RH, Fretland DJ, Baron DA, Ryan US, Riley DP. Manganese-based superoxide dismutase mimetics inhibit neutrophil infiltration in vivo. J Biol Chem 1996;271(42):26149-26156. 35.Springer TA. Adhesion receptors of the immune system. Nature 1990;346(6283):425-434. 36.Patel KD, Zimmerman GA, Prescott SM, McEver RP, McIntyre TM. Oxygen radicals induce human endothelial cells to express GMP-140 and bind neutrophils. J Cell Biol 1991;112(4):749-759. 37.Lo SK, Janakidevi K, Lai L, Malik AB. Hydrogen peroxide-induced increase in endothelial adhesiveness is dependent on ICAM-1 activation. Am J Physiol 1993;264(4 Pt 1):L406-L412. 38.Simeonova PP, Luster MI. Asbestos induction of nuclear transcription factors and interleukin 8 gene regulation. Am J Respir Cell Mol Biol 1996;15(6):787-795. 39.Van Wetering S, Mannesse-Lazeroms SP, Dijkman JH, Hiemstra PS. Effect of neutrophil serine proteinases and defensins on lung epithelial cells: modulation of cytotoxicity and IL-8 production. J Leukoc Biol 1997;62(2):217-226.